The first reviews and early reactions to Zoya Akhtar’s Gully Boy, starring Ranveer Singh and Alia Bhatt, are out, and they are overwhelmingly positive. The film, which recently had its world premiere at the Berlin International Film Festival, has been receiving immense praise from Indian critics as well as global festival programmers. Gully Boy is set to release on February 14 and actors, Alia Bhatt and Ranveer Singh has been promoting the film non-stop. The film is based on street rappers in the movie. And Ranveer has been showcasing his rapping skills and did so at the Berlinale as well. Recently, Gully Boy has its world premiere at the Berlin International Film Festival. The movie has been receiving immense praise from the global festival programmers. After the show of Gully Boy, Ranveer Singh and Alia returned to India on Monday. Moreover, the film, Total Dhamaal team members, Anil Kapoor, and Madhuri Dixit are all set for their upcoming comedy. Both of them graced the sets of Super Dancer 3 and enjoyed a lot with the participants as well as judges that included Shilpa Shetty, director Anurag Basu, and choreographer Geeta Kapoor. Meanwhile, Ajay’s Devgn’s daughter Nysa Devgn and aunt Tanisha Mukherjee were seen having a good time at Yauatcha, Bandra Kurla Complex. Several celebs were also spotted at the airport. They include Malaika Arora, Kajol, Ranveer, Alia, Sonam Kapoor Ahuja, and Rohit Shetty. Taapsee Pannu was spotted at a launch event whereas Saif Ali Khan was seen with son Taimur Ali Khan in Bandra. “We’re taking our time.” says Nick Jonas when asked about having kids anytime soon. 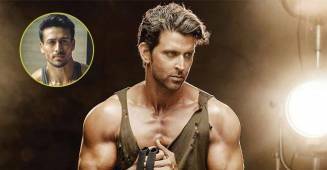 Hrithik Roshan does not step back when it comes to fitness and health, Tiger Shroff praises the energy. 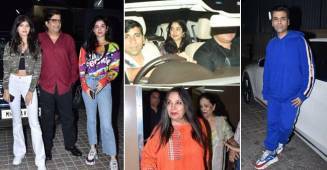 Stars like Janhvi Kapoor, Khushi Kapoor and Karan Johar attends Kalank’s special screening.